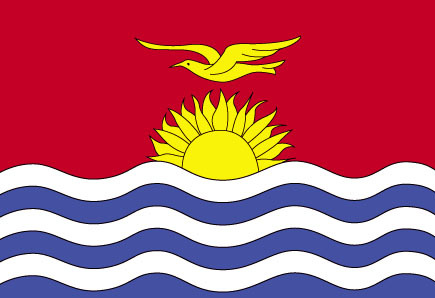 and the associated islands of Cook Islands , Niue , and Tokelau . Headquarters of the SPC GeoScience Division, SOPAC. Campbell, J.R. and F. Cuny. 1983. "Agricultural Development and Disaster Preparedness". Prepared for the Disaster Preparedness Strategies Seminar, 23-25 March 1983, Suva, Fiji. PIDP (Pacific Islands Development Program), Honolulu, Hawai'i, U.S.A., full text (2,825 kb in PDF). Lewis, J. 1976 (May). A Report to Establish Guidelines for the Management of a Regional Fund to Provide Insurance For Natural Disaster, Prepared at the Request of the Commonwealth Fund for Technical Co-Operation for the South Pacific Bureau for Economic Co-Operation, full text (4,505 kb in PDF). Lewis, J. 1976. "Precautionary planning for Natural Disaster in the South Pacific", A Paper Presented at the South Pacific Preparedness and Relief Seminar, Suva, Fiji, September 1976. Seminar Jointly Sponsored by the League of Red Cross Societies and the Commonwealth Secretariat., full text (773 kb in PDF). Lewis, J. 1977. "Disaster preparedness in the South Pacific", a Paper presented at the South Pacific Disaster Preparedness and Relief Seminar, Suva, Fiji, in September, 1976, South Pacific Bulletin, First Quarter 1977, pp. 14-20, full text (1,035 kb in PDF). Mercer, J. 2004 (April). "Reducing vulnerability in South Pacific Small Island Developing States: The Indigenous or Modern Way?" i-Rec Information and Research for Reconstruction Conference, Coventry, U.K., full text (126 kb in PDF). Roper, T. 2009. "Climate Change - A Challenge for the Pacific Nations", full text (510 kb in PDF). Roper, T. 2009. "Climate Change - A Challenge for Pacific Nations and their Utilities". Pacific Power Association, September, pp. 11-13, full text (732 kb in PDF). 2008. Proactive Partnerships - Enhancing Utility Performance, full text (577 kb in PDF). 2008. How Promoting Efficiency Helps You and Your Customers, full text (1,210 in PDF). 2009. Energy Policy: The Way Ahead, full text (383 kb in PDF). UNDRO/SPPO. 1991 (July). Mission Report: Disaster Management and Mitigation Possibilities and Insurance Aspects. UNDRO/SPPO (Office of the United Nations Disaster Relief Co-ordinator) South Pacific Programme Office, Suva, Fiji, full text (3,428 kb in PDF). Lewis, J. 1987. "Cook Islands Cyclone". Australian Overseas Disaster Response Organisation Newsletter, vol. 5, no. 1 (April), full text (120 kb in PDF). Hezel, F.X. 2009. "High Water in the Low Atolls". Micronesian Counselor, no. 76 (March), pp. 1-20, full text (825 kb in PDF). Henry, R., W. Jeffery, and C. Pam. 2008. Heritage and Climate Change in Micronesia: A Report on a Pilot Study Conducted on Moch Island, Mortlock Islands, Chuuk, Federated States of Micronesia January, 2008. Department of Anthropology, Archaeology and Sociology, School of Arts and Social Sciences, James Cook University, full text (4,180 kb in PDF). Namakin, B. 2007. "Climate Change is Real". Micronesian Counselor, no. 70 (December), pp. 1-20, full text (950 kb in PDF). 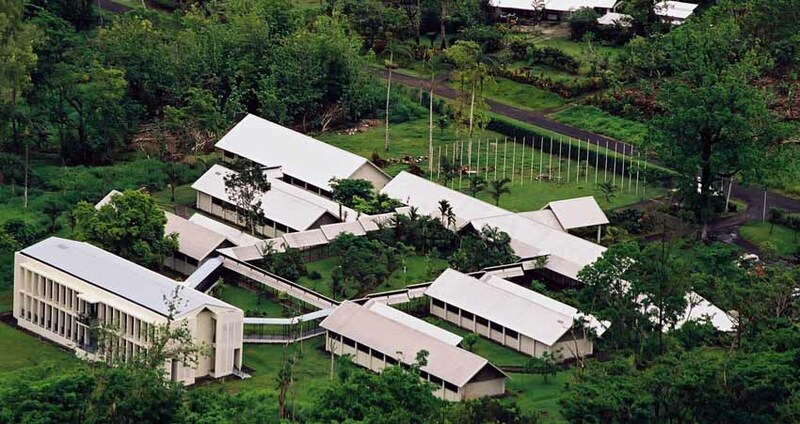 Yap State Department of Resources & Development. 2009. 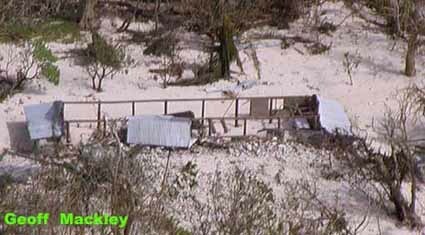 Joint Preliminary Tidal Surge Damage Assessment, Yap Outer Islands, January 5-14, 2009. Yap State Department of Resources & Development, Federated States of Micronesia, full text (1,923 kb in PDF). Baptiste-Brown, S. 2012. When A People Risk Losing Their Country to the Effects of Climate Change: The Social Implication of International Climate Change Displacement for Kiribati. Master of International Development and Management dissertation at Lund University, Sweden full text (701 kb in PDF). This research's foundation is the current state of affairs in Kiribati in relation to the effects of climate change and how the nation will face the future. 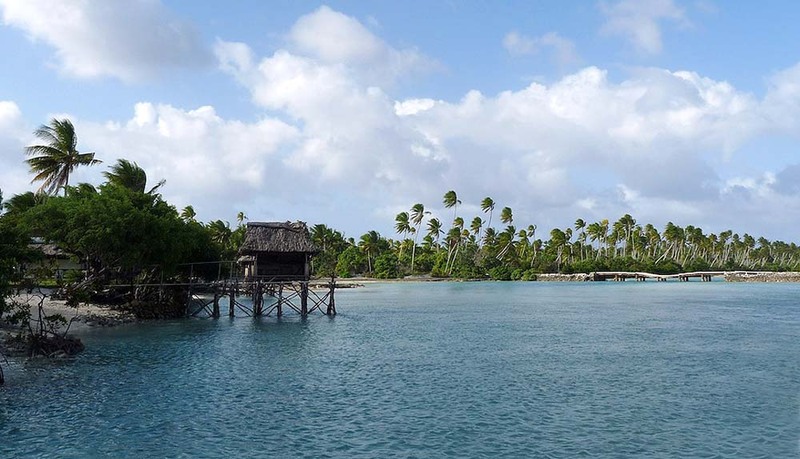 The paper examines how different actors in Kiribati are helping the country prepare for possible climate change displacement in the future, from the viewpoint of said actors. Interview data, supplemented by observational data from time spent in the field are the primary sources of data presented. The research uncovers the importance of education, skills training, and language in the advancement of employability in a new country context. The data attests to the fact that these areas that frame social life are currently functioning well or have encouraging plans in place. Less optimistically, the data details the wanting nature of the areas of institutional coordination and public communication. The paper closes with a set of recommendations based on the gaps exposed in the findings. 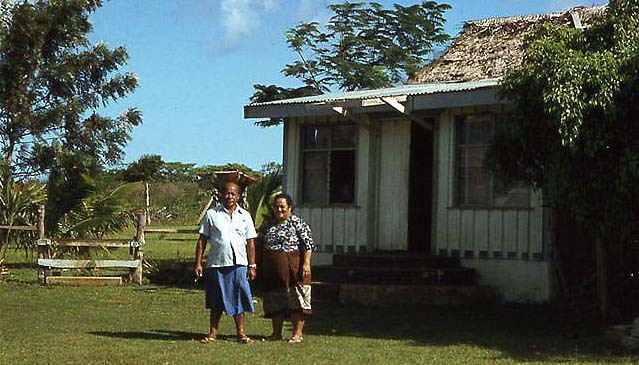 Traditional home in North Tarawa and the bridge to South Tarawa. Connell, J. and M. Maata. 1992. 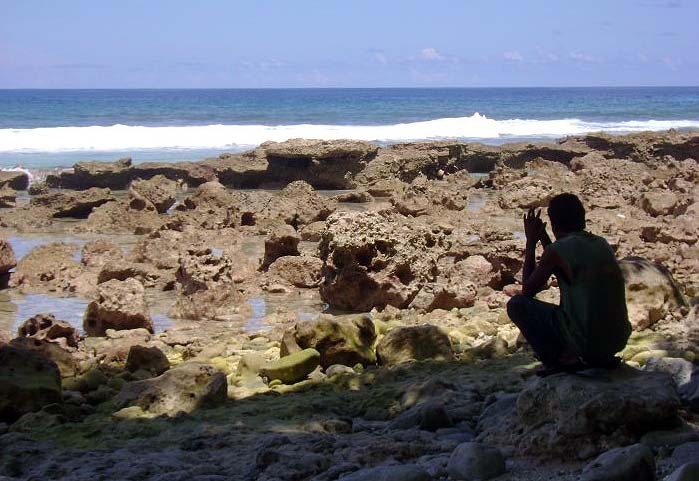 Environmental Planning, Climate Change and Potential SeaLevel Rise: Report on a Mission to the Republic of the Marshall Islands. SPREP (South Pacific Regional Environmental Programme), Apia, Samoa, full text (3,332 kb in PDF). Naidu, J.R., Greenhouse, N.A., Knight, G., and E.C. Craighead. 1980. Marshall Islands: A Study Of Diet And Living Patterns. BNL 51313 UC-11 (Environmental Control Technology and Earth Sciences - TIC-4500), Safety and Environmental Protection Division, Brookhaven National Laboratory, Upton, New York, U.S.A. , full text (1,088 in PDF). PIDP. c. 1984. Kokkal ion bar im jab ion bok (a guide to housing materials in Marshallese). 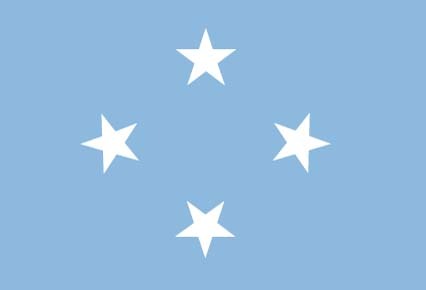 Government of the Republic of the Marshall Islands, Majuro, Marshall Islands, PIDP (Pacific Islands Development Program), Honolulu, Hawai'i, U.S.A., full text (5,362 in PDF). Watching the sea on the Marshall Islands. Jansweijer, J. 2014. Integrating Disaster Risk Reduction and Climate Change Adaptation: The Influence of the Adaptive Capacity of Local Government Units in the Philippines on the Potential for Incorporating CCA Policies in Their Local DRR Management Plans. Master of Arts at King's College London, full text (2,348 kb in PDF). This study aims to assess the components of adaptive capacity and the influence of these components on the ability of local governments in the Philippines to incorporate Climate Change Adaptation policies into their existing Local Disaster Risk Reduction Management Plans. The framework for this study is composed of the components of adaptive capacity and their influence on the adaptation process. After assessing the adaptive capacity and the adaptation process of local governments in the Philippines, the study finds that successful integration of Disaster Risk Reduction (DRR) and Climate Change Adaptation (CCA) depends not only on sufficient adaptive capacity, but also on the need for significant overlap between the communities of DRR and CCA. Kelman, I. 1998. 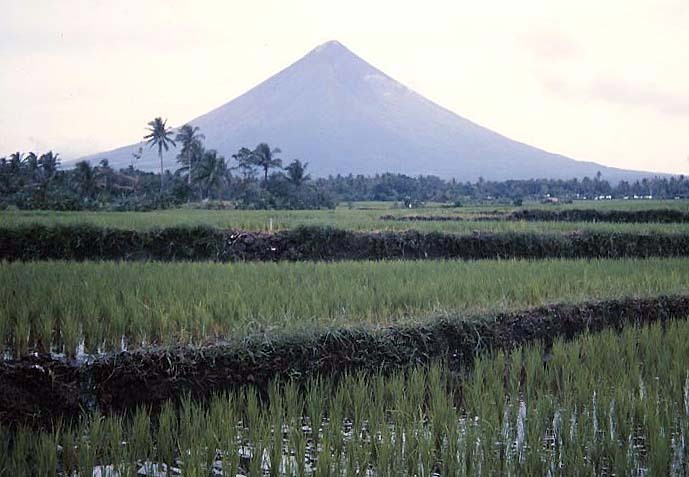 Role of Technology in Managing Vulnerability to Natural Disasters, with Case Studies of Volcanic Disasters on Non-Industrialized Islands (including the case study of Mount Pinatubo). Master of Applied Science dissertation at the University of Toronto, Canada, full text (links to another website with the downloads). Leeftink, F. 2013. Coping after typhoon Pepeng: A case study of indigenous practices and external aid in the Cordillera, Philippines. MSc dissertation, Department of Social Science, Wageningen University, the Netherlands, full text (5,124 kb in PDF). Contemporary global and local pressures tend to increase the vulnerability of indigenous peoples, while at the same time natural hazards occur more frequently. There is, however, not much literature on indigenous responses to disaster and how these are changing in a modernising world. We respond to this gap by studying coping strategies of indigenous peoples and the way they deal with outside interventions for disaster mitigation. Using first-hand stories of aid recipients and providers, this thesis looks into typhoon Pepeng (Parma) that hit the indigenous communities of Northern Luzon in 2009. Three years later, this is the first thorough evaluation of the disastrous landslides and the relief, reconstruction and preparedness efforts that were taken afterwards. Through this case we explore (1) different indigenous coping mechanisms and their dynamics, (2) the interface with external aid providers and (3) the everyday practices, struggles and politics of coping after disaster. It furthermore provides important contextual information on the indigenous worldview of the Igorots and Philippine disaster management in historical perspective. The main finding is that the phase of reconstruction, more specifically the rebuilding of houses and recovery of livelihoods, is most challenging. The reason for this is the deficiency and mismanaging of external aid and decreasing social cohesion within the communities. Better alignment between local and external parties and greater understanding of indigenous coping strategies is recommended to overcome these issues â€“ especially in a country that faces so many natural hazards. Vaiciulyte, S. 2014. Social Media and Disaster Response An analysis of the crisis management following Typhoon Haiyan. MA in International Communications and Development, Department of Sociology, City University, London, full text (1,615 kb in PDF). This dissertation aims to explore the use and impact of social media in natural disaster response. The research project will seek to evaluate the impact of social media through the examination of the case study of typhoon Haiyan (Yolanda) which made landfall in the Philippines in 2013 and severely damaged the region and other parts of South East Asia. It has been argued that Twitter, Facebook and third party applications enhanced the efforts of non-governmental organisations and rescue teamsâ€™ capacity to respond and save lives. Moreover, news media coverage emphasised the case stories of beneficiaries who have received aid when communicated their crisis situation via social networks. This research project assessed social media assistance in operations and communication processes. It is done by critically capturing sociological debates on individualsâ€™ and communitiesâ€™ ability to engage with social media for the benefit of others. The literature review explored the relationship of societies, information and computer mediated communication. However, the need to connect the technological advancement in communication also led to exploring specific methods of humanitarian response, such as crowd-sourcing and gathering social media intelligence. Thus, there was a consequential need for the analysis of social media content. Research results were derived from the analysis of social media content within 72 hour timeframe of the disaster and were followed by qualitative interviews with disaster response practitioners. Half of the interviews were conducted in the UK and were followed by a two week field research in Manila, Philippines, which afforded the opportunity to interview those directly involved in the rescue mission and to learn of the experience obtained by organisations during the typhoon Haiyan disaster response. It is argued in this dissertation that that social media is to be viewed as a tool, acting as additional source for humanitarian relief initiatives. Although social media is not seen to be effective in terms of relief operations, from a communications perspective, it does hold benefits. For example, social media calls for organisationsâ€™ better accountability to the public and helps reinforce fundraising initiatives that are often followed by the rise of an organisationâ€™s profile. The findings of this dissertation add to the current literature with regards to new media in disaster management and advocates further initiatives in research, and the development of methods for crisis communication in both the short-term and long-term natural disaster response. 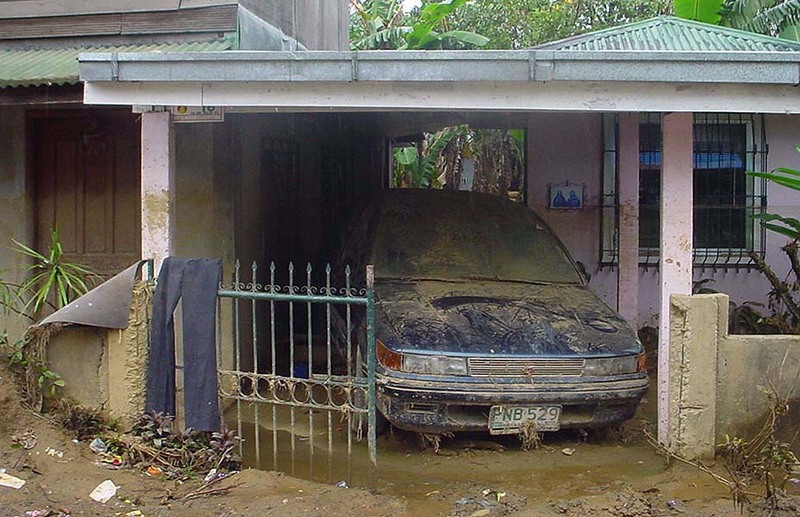 Infanta, Quezon showing damage following the late-2004 typhoon disaster. Blake, B. 1993. "Housing and cyclones: Reducing vulnerability of Samoan fales", AODRO Newsletter, (Australian Overseas Disaster Response Organisation), vol. 11, no. 1 (March), p. 3-7, full text (825 kb in PDF). Le De, L. 2011. Post-Disaster Reconstruction Strategy: Opportunity or Opportunism? 2009 Tsunami in Samoa as a Case Study. Master of Science in Environmental Management dissertation from the University Of Auckland, New Zealand, full text (2,002 kb in PDF). Reported natural disasters have significantly increased over the last fifty years. Because of their high exposure to natural hazards and limited economic capacity, developing countries are recognized by the international aid community to be the most vulnerable to disasters. In 1990, the International Decade for Natural Disaster Reduction was created to promote ideas of disaster reduction, identifying vulnerability as one of the priorities. The idea that vulnerability reduction is a matter of development is the mainstream discourse of agencies involved in disaster response. Within this general discourse, issues of vulnerability depend on adaptive capacity, technical knowledge, awareness and good governance. For the international aid community, lack of capacity and knowledge can be overcome by means of policy learning transfer from industrialized countries to developing nations. However, there are contrasting views, as some affirm that this approach reflects a top-down, technocratic and Western expert approach that is based on socio-cultural belief and perceptions of 'man' and 'nature'. Others state that most agencies have used vulnerability in the way that best fits their practices, and that this concept is utilized as a justification by developed countries to intervene in the affairs of developing nations. In 2009, a tsunami hit Samoa, resulting in considerable damages and mobilising the international aid community. Through this case study, this research explores how the mainstream use of the concept of vulnerability shapes the post-disaster management. The reconstruction of housing, land transport infrastructure and tourist accommodation and the utilisation of vulnerability reduction and risk mitigation measures are critically observed. Moreover, the role that different agencies play in shaping the decision making process is analysed, and the recovery strategy is explored and criticized. A qualitative research was undertaken, using a range of techniques including semi-structured interviews, scoping and observations on the field, and the analysis of policy documents. Findings show that international aid partners have an influence on shaping the policy carried out by the government of Samoa. The research qualifies the recovery approach as technocentrist and develops the argument that the strategy used has been lacking in considering the socio-cultural aspects inherent to the Samoan society. Nelson, F., G. Roberts, and M. Daly. 2008. Reducing the Vulnerability of Coastal Communities in Samoa: A Partnership Approach, full text (40 kb in PDF). Boyle, C. 1989. "The Development of 'Basket-Weave' Construction", AODRO Newsletter, (Australian Overseas Disaster Response Organisation), vol. 7, no. 4 (December), p. 3-6, full text (888 kb in PDF). Britton, N.R. 1986. Article on Tropical Cyclones Martin (Fiji) and Namu (Solomon Islands), AODRO Newsletter, (Australian Overseas Disaster Response Organisation), vol. 4, no. 2 (June), p. 2-8, full text (1,035 kb in PDF). PIDP. 1984. How To Strengthen a Solomon Islands House. PIDP (Pacific Islands Development Program), Honolulu, Hawai'i, U.S.A., full text (4,540 kb in PDF). Radford, D. and R. Blong. 1992. "Assessment of Natural Hazards in the Solomon Islands and Implications for Other Pacific Island Countries", AODRO Newsletter, (Australian Overseas Disaster Response Organisation), vol. 10, no. 3 (September), p. 3-9, full text (1,029 kb in PDF). The Frigate Bird Can Soar: adaptation to environmental change in Solomon Islands. Report of the workshop on Community Adaptation and Resilience: Local Relocations Induced by Rising Sea Levels in the Solomon Islands, Honiara, Solomon Islands, 4-5 November 2010, full text (540 kb in PDF). On 28 December 2002, the islands of Tikopia and Anuta of the Solomon Islands suffered one of the most severe tropical cyclones ever recorded in the area, Category 5 Cyclone Zoe. Tikopia and Anuta are accessible only by boat and are isolated and remote even by small island standards. After the tropical cyclone passed, no communication could be established with the islands. Rather than governments taking the initiative to discover what had happened to their own people or neighbours, it took a Western (Kiwi) film-maker, Geoff Mackley, to hire a Cessna in Vanuatu. On 1 January 2003, he broke the story of complete devastation, a contaminated water supply, and a few survivors improvising shelter. The photographs below were taken during the flight over Tikopia and Anuta on 1 January 2003 by Geoff Mackley who kindly gave his permission for the images to be reposted here. 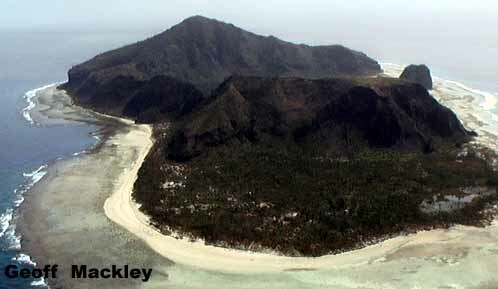 Mackley's trip was the first contact which the outside world had had with these islands since the cyclone had hit, but he could not land due to a lack of an airstrip. Mackley reported "every tree on the island has been blown over or shredded, the island is completely denuded of vegetation, almost every building has been damaged, quite a few remain traditional huts remain intact, while others have been shredded, and the sea has come through some villages and run into the lake which is the islands only water source, this sort of destruction is normally seen only after a strong tornado or volcanic eruption, a number of people, maybe 20 came down to the beach to watch us fly over, my pilot said he counted about 100 people in total, some signalled us with sheets of white plastic, others just sat there". His words were irresponsibly misquoted by some media which reported that everyone was dead and that the islands were flattened by tornadoes. Movement towards relief operations occurred only after Mackley's story broke, but further delays resulted from the Solomon Islands governmentâ€™s lack of money to pay for ships, crews, and supplies. Australia and New Zealand donated money, but with concerns about corruption since previous aid to the Solomon Islands had been squandered. Then, logistics issues including weather and seeking a larger vessel further delayed the trip. In the meantime, an Australian military aircraft flew over the islands. 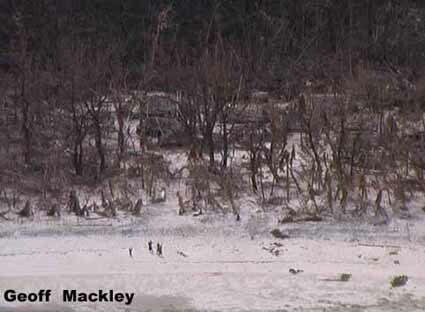 The crew contradicted some of Mackley's statements, in particular not painting such a bleak picture, yet they produced no solid evidence to back up their statements. For example, they suggested that the people were okay because they were building and repairing shelters. After five days, it should be obvious that people will start to reconstruct, irrespective of losses experienced (or, perhaps, not experienced). The building of shelter after a disaster, as with eating and drinking, indicates common sense and a desire to meet individuals' and communities' basic needs. Photographs taken during a flight over Tikopia and Anuta on 1 January 2003 by Geoff Mackley who kindly gave his permission for the images to be reposted here. 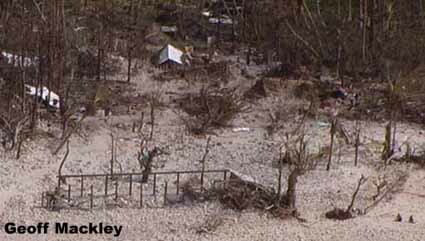 For The Weekend Australian, Mackley hired a helicopter in Vanuatu and landed on Tikopia Island with some relief supplies on 3 January 2003. All the islanders had survived by sheltering in caves which they regularly use to shelter from cyclones. Their food and water situation, however, was dire. As well, one islander estimated that, due to the destruction, they might not be able to be self-sufficient in food for three years. From one perspective, the affected islanders did exactly what they should have done and managed to reduce their vulnerability by being aware of the impending storm, warning the community, and acting appropriately and timeously to the warnings. Some commentators had stated that these islanders are entirely self-sufficient and are used to dealing with severe cyclones. Nonetheless, the disinterest displayed by governments in acting swiftly shows a lack of common sense and basic respect in checking that compatriots and neighbours are okay, particularly when it was unclear if sustainability endeavours have been supported or successful in the past. If a film-maker could do it, so could governments. Concerns were raised about political issues hampering relief efforts. 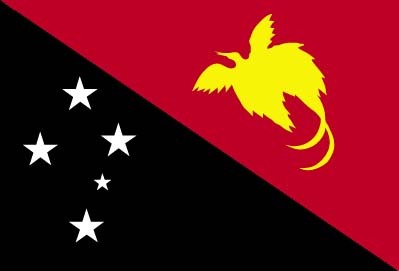 The Solomon Islands' government and the people of Tikopia and Anuta were reported to be from different ethnic groups which has led to tension and non-payment of taxes. 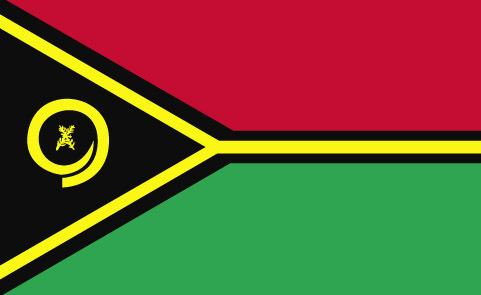 As well, the closest inhabited islands to Tikopia and Anuta belong to Vanuatu. The possibly most efficient relief operation would then have been based in a different country, potentially causing loss of face to the Solomon Islands. Narrower, specific questions also need to be answered. When the Australian military aircraft flew over the islands, why did they not parachute in a basic communication device such as a radio or satellite phone (whichever would work better) along with instructions on how to use it? Even better, why did someone not parachute in with communication devices and some basic supplies? They would not be on the island for more than one week and they could have assessed the situation and reported back immediately. Rescue services and the military risk their lives to rescue daredevils in races or doing stunts, including incidents in the middle of the sea. Australia paid Pacific islands to take refugees that were not good enough to set foot on Australian soil. Yet they could not do a small, quick, relatively cheap, relatively less risky task for people in need through little fault of their own. As a precautionary measure, airdrops of food and water could have been made. If these supplies were not needed, then little would have been lost (assuming that the airdrops did not land on something valuable or on people, as has happened in the past). Such airdrops were conducted by the military during the war in Afghanistan at the end of 2001, so the logistics capability exists. Tikopia is clearly within helicopter range, so why did no government bother? Mackley also compiled a list of stupid statements made on the situation by politicians. These statements, corroborated by other reports, show an astounding lack of interest in establishing facts along with a reprehensible attitude towards human beings suffering disaster. Has the West really become so insular--creating our own societal islands--and so insensitive that we do not even care that such attitudes augment our own social vulnerabilities? Cyclone Zoe has epitomised the vulnerabilities and isolation of islands. The vulnerabilities were exacerbated, and the isolation was enhanced, by inexcusable human decisions and actions outside the islands affected by the immediate disaster. A new disaster, one of not caring, has emerged. This disaster has far more grievous long-term consequences than the initial event which led to this situation. 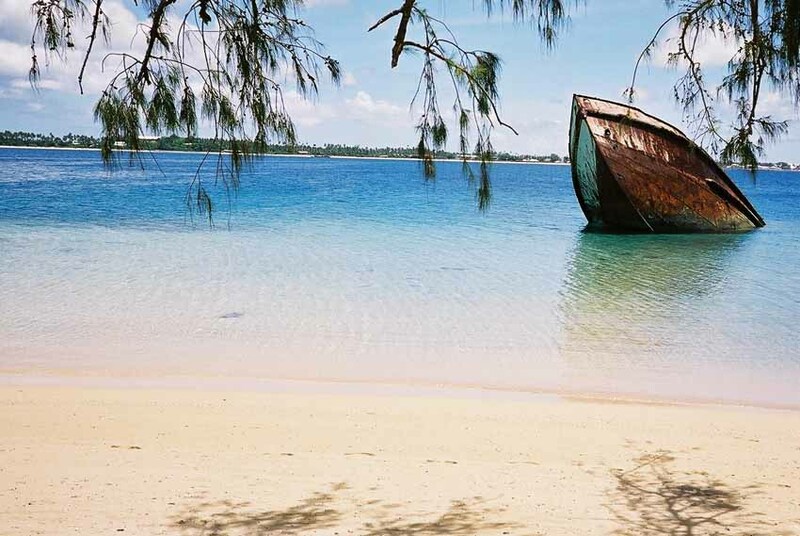 Ship Said to Have Been Sunk During Cyclone Isaac in 1982. Latukefu, T. 1986. "A Tongan Perspective on the Impact of Disaster Emergency Aid Following Cyclone Isaac", AODRO Newsletter, (Australian Overseas Disaster Response Organisation), vol. 4, no. 3 (September), p. 10-14, full text (553 kb in PDF). Lewis, J. 1978. Mitigation and Preparedness for Natural Disaster in the Kingdom of Tonga. Summary of the Report of a Technical Assistance Assignment under the auspices of the Ministry of Overseas Development, London to the Government of the Kingdom of Tonga. Undertaken in June and July 1978. Report submitted August 1978, full text (68 kb in PDF). Lewis, J. 1979. "Volcano in Tonga". Journal of Administration Overseas, vol. XVIII, no. 2 (April), pp. 116-121, full text (327 kb in PDF). James Lewis writes (2 February 2008): "Town Officer Moeake Tokai and his wife the day after he had recounted to me the story of the 1946 eruption and subsequent evacuation from Niua Fo'ou. Taken at their house on 'Eua, Tonga in 1978". Lewis, J. 1981 (16 October). "Project Proposal Outline: Field Identification of development projects for disaster mitigation". Prepared for the United Nations Environment Programme, full text (1,371 kb in PDF). Lewis, J. 1989 (January). "Affordability and participation, need and vulnerability: Post-cyclone rehousing in Tonga". Presented at the Sixth Inter-Schools Conference on Development, March 1989, Centre for Development Planning Studies, the University of Sheffield, full text (376 kb in PDF). Murofushi, T. and N. Hori. 1997. â€œHuman impact on mangrove habitats maintenance against sea-level change: case study of Tongatapu island, the Kingdom of Tonga, South Pacificâ€�. Geographical Reports of Tokyo Metropolitan University 32: 27-42, full text (887 kb in PDF). Oliver, J. 1986. "The Environment of Disaster Aid: The Socio-Economic Impact of Cyclone Isaac on Tonga, March 1982", AODRO Newsletter, (Australian Overseas Disaster Response Organisation), vol. 4, no. 3 (September), p. 4-10, full text (789 kb in PDF). Oliver, J. and G.F. Reardon. 1982. Tropical Cyclone 'Isaac': Cyclonic Impact in the Context of the Society and Economy of the Kingdom of Tonga. Disaster Investigation Report No. 5, Center for Disaster Studies, James Cook University of North Queensland, Townsville, Australia, full text (10,140 kb in PDF). Pelesikoti, N. 2006. Sustainable Resource and Environmental Management In Tonga: Current Situation, Community Perceptions and A Proposed New Policy Framework. PhD dissertation from Environmental Science, Faculty Of Science, University Of Wollongong, Australia, full text (2,916 kb in PDF). The success of Tonga's current and future development depends on sustainable management of its natural resources. However, with increasing population, changing socio-economic aspirations and activities, the quality and quantity of the biophysical environment are declining. This is likely to be exacerbated if the major environmental issues are not addressed immediately. Unsustainable practices in agriculture and fishing, and population related pressures such as waste generated and increasing demand for natural recourses coupled with a specific system of management have been identified as the major causes of environmental degradation. The Government has not been committed to sustainable management of natural resources and to the management of the outputs of resource use. Thus, most of the previous legislation and policies have lacked provisions for environmental consideration in socioeconomic developments. This work aimed to fulfill a number of objectives that contribute to the process of sustainable resource and environmental management in Tonga. These are: 1) assessing the state of the environment; 2) evaluating the barriers to sustainable resource and environmental management; 3) determining the development priorities of the community in Tonga; and 4) formulating of a new national policy framework for sustainable resource and environmental management. Reardon, G. and K. Eaton. 1986. Article about tropical cyclone Isaac hitting Tonga, AODRO Newsletter, (Australian Overseas Disaster Response Organisation), vol. 4, no. 2 (June), p. 11-13, full text (453 kb in PDF). Tongilava, S.L. 1994 (November). Traditional Practices and their Implications for Sustainable Development in Tonga. SPREP (South Pacific Regional Environment Programme) Reports and Studies Series no. 71, full text (3,392 kb in PDF). 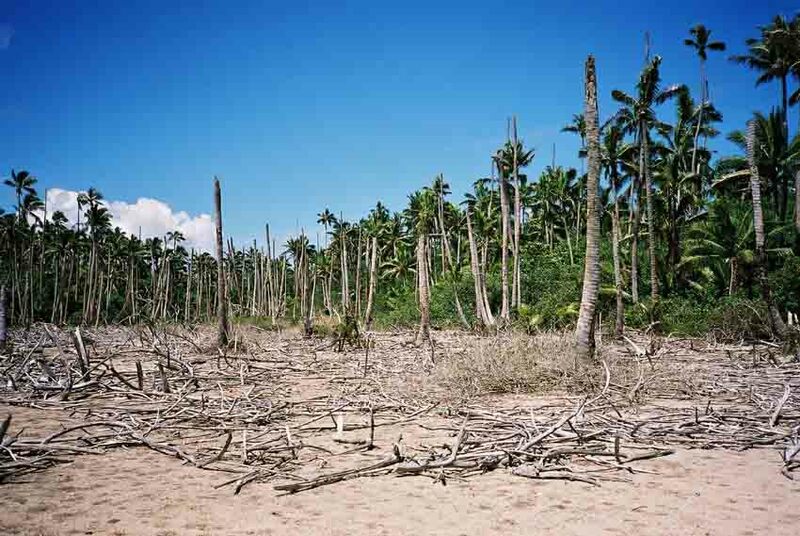 Environmental Damage, Said to be From Cyclone Heta in 2004. Baines, G.B.K., P.J. Beveridge, and J.E. Maragos. 1974 (December). "Storms and Island Building at Funafuti Atoll, Ellice Islands". pp. 485-496 in Proceedings of the Second International Coral Reef Symposium 2, Brisbane, Australia, full text (1,234 kb in PDF). Baines, G.B.K. and R.F. McLean. 1976. "Re-Surveys of 1972 Hurricane Rampart of Funafuti Atoll, Ellice Islands". Search, vol. 7, no. 1-2 (Jan.-Feb.), pp. 36-37, full text (210 kb in PDF). DahlstrÃ¶m, J. 2008. In the Eye of the Storm â€“ Risk Perception and Perceived Adaptive Capacity among Civil Society Leaders in Tuvalu. Masters thesis in Development Studies from the Department of Government, Uppsala University, Sweden, full text (3019 kb in PDF). Tuvalu is a nation highly exposed to climatic changes, such as rising sea levels. It is so threatened that some studies suggest it will be uninhabitable within a few decades. Because it is understood that Tuvalu can do nothing to avoid this destiny, no focus has been placed on explaining the way social and ecological systems can actually avoid or adapt to environmental impacts. This scientific conceptualization foresees that environmental impacts on local ecologies cannot be completely attributed to global warming, but are also the fruit of human-led, unsustainable practices. Today unsustainability is a reality in Tuvalu, where natural protections against climate change are being explored. Previous studies have asserted that the peopleâ€™s behavior influences the capacity of the Tuvaluan islands to adapt to climate changes. Therefore, in order to respond to this research gap, this study employs the Protection Motivation Theory (PMT), to examine the risk perception and perceived adaptive capacity among Tuvaluan civil society leaders. By doing so, this theory could suggest insights into whether maladaptive or adaptive outcomes are likely. The focus on civil society leaders is motivated by their strong capacity to make decisions on behalf of their communities due to the hierarchical Tuvaluan society. The result of this study shows that one reason why maladaptations occur is that no leaders had adaptive intentions in the first place, either because they were more worried about other perceived threats related to modernization or because of the disbelief that local actions could be effective in resisting climate changes. Modernization priorities, religious views, and threat experience appraisal were the factors found to greatly influence how leaders perceived climate changes. Falani, P. c. 1972. Te Alikeni i Funafuti, Tuvalu; The Hurricane in Funafuti, Tuvalu. Publisher not indicated, full text (2,175 kb in PDF). Gillett, R. 1988 (September). Tokelau and Tuvalu: An Atoll Fisheries Bibliography. 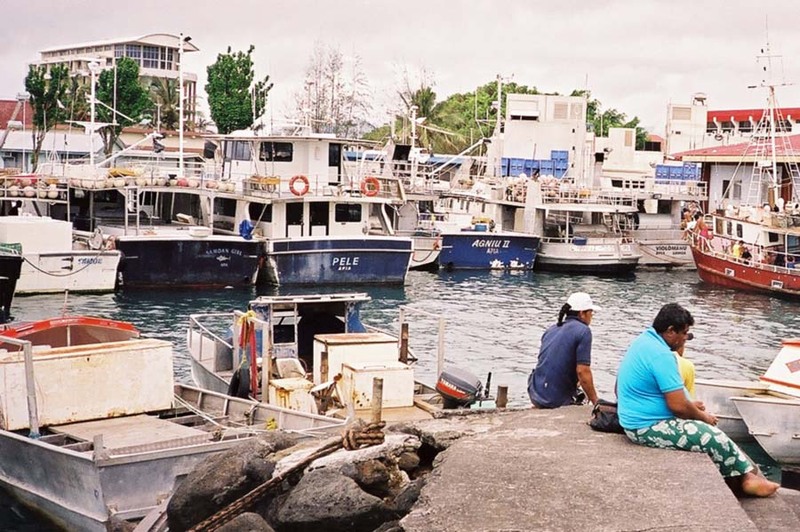 Field Document 88/4, FAO/UNDP Regional Fishery Support Programme, Suva, Fiji, full text (210 kb in PDF). Talia, M. 2009. Towards Fatele Theology: A Contextual Theological Response in Addressing Threats of Global Warming in Tuvalu. Masters thesis in Theology from Tainan Theological College and Seminary, Tainan, Taiwan, full text (3,696 kb in PDF). This study aims to construct a contextual theology that unites the people of Tuvalu in response to threat of global warming related sea level rise. Although the problem of global warming affects the whole planet, this study will only focus on Tuvalu. Attempting to resolve the danger that the people of Tuvalu face in daily life one contribution towards finding human strategies to resolve the global crisis. Construction of contextual theology creates critical awareness in the people of Tuvalu regarding the danger of global warming related sea level rise. After establishing such awareness, fatele (Tuvalu traditional dance) is proposed as a contextual theology employed to unite all of Tuvalu in one voice to respond to the danger of global warming related sea level rise. As the Tuvaluans respond in a united fashion, they unite within the presence of the Divine in performing fatele. 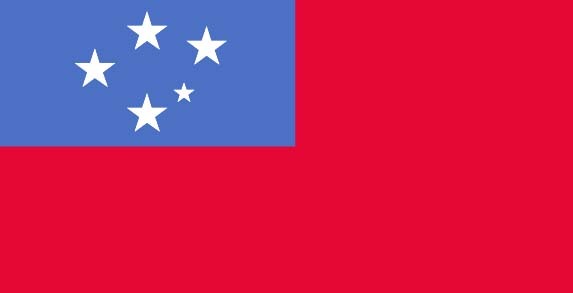 Utilization of fatele theology will aid Tuvaluans to see the importance of solidarity. In the same way, the churches of Tuvalu should pay attention to the significance of fatele and adopt it as a theological methodology to unite their members to combat global warming and other pressing issues of the present time. Fatele theology invites all to participate by singing and dancing to resolve this global crisis. 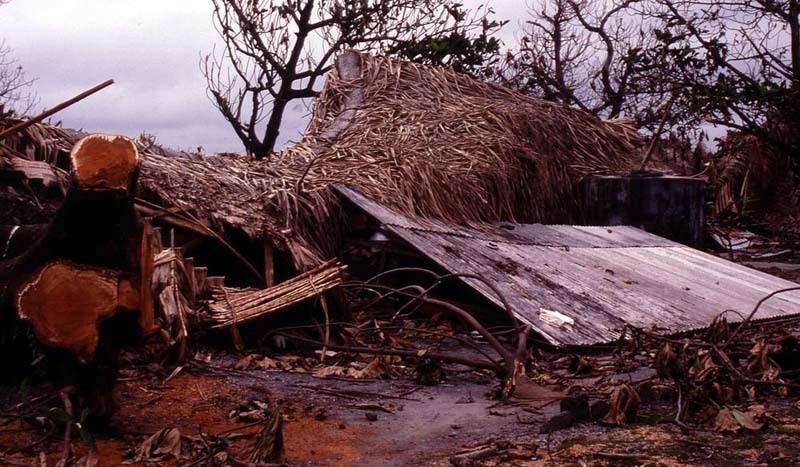 Collapsed roof after a storm on Vaitupu. Miller, D. 2009. Keeping Sediment Off The Reef: A project using vetiver grass to trap sediment and re-establish indigenous forest - Aneityum Island, Vanuatu, full text (3,314 kb in PDF). Shorten, G.G. and S. Schmall. 2003 (May). Disaster Risk Management in Marginal Communities of Port Vila, Vanuatu: Project Summary. 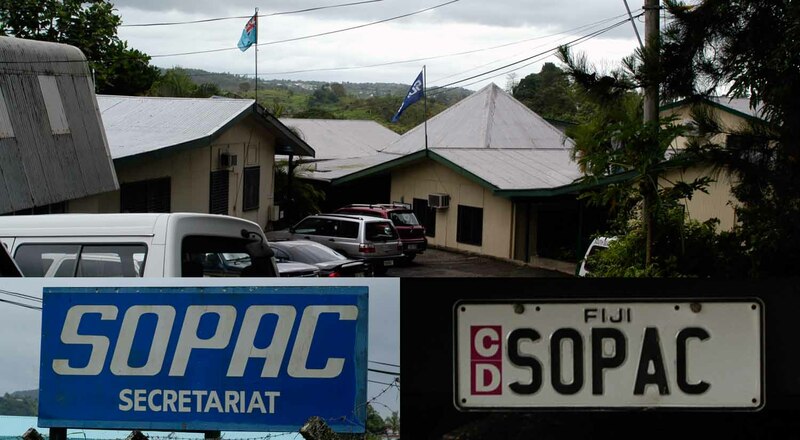 SOPAC Miscellaneous Report 507, SOPAC, Suva, Fiji, full text (4,531 kb in PDF).